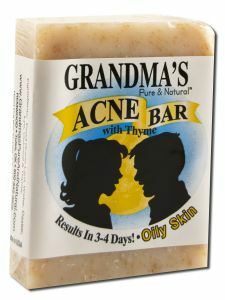 Grandma's Acne Bar for Oily Skin 4 oz. Use this special acne soap as your only "all over daily shower soap" for face & body. Wash face before bed & additionally as needed to clean pores. Continue using after acne clears to fight bacteria with thyme to keep pores clean & acne under control. Acne may appear to worsen at first because Acne Bar is cleaning the pores and drawing out the impurities. Most see improvement in 3-4 days. Cystic acne may take considerably longer to improve. Ingredients: Food Grade Lard, Water, Castor, Lye, Oatmeal & Thyme.